New Yorkers are not known for their humility. Least of all when it comes to pride in their city. Folks around here are known for believing this city is the Center of the Universe. When I first moved here at eighteen, it took a while for my midwestern sensibilities to adjust to such hubris. Ohio doesn't exactly boast that same kind of unstoppable, insurmountable pride. And Cleveland certainly doesn't. While Clevelanders are fiercly loyal to their city, and will defend it's honor to their dying breath, they do not, typically, consider it the greatest place on earth, or the end-all-be-all of American cities. When a Clevelander tells you where they are from, it's with a note of caution. They're wondering if you're going to mention LeBron's departure, the sad state of the economy, the terrible luck of the Cleveland Browns, or perhaps the dreaded "Didn't your river catch fire?" But there is plenty to be proud of in Ohio. There is the lovely, endless-seeming lake, a river valley of wonderful parkland, beautiful rolling Appalachian foothills, dense swaths of lush forest, ancient caves complete with waterfalls, and wide open farmlands full of waving corn stalks. And then there is the corn itself. I've said it before, and I will say it at least 100 times more, the best corn in the world comes from Ohio. 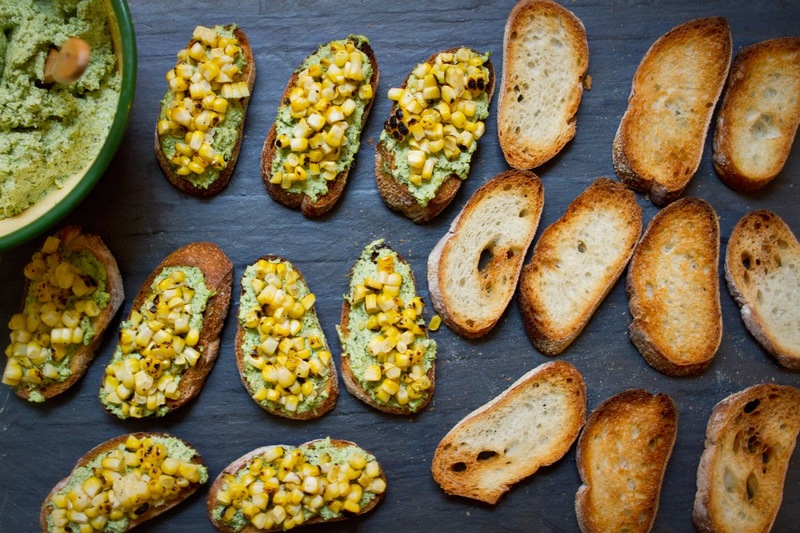 Roasted corn on the cob is a staple of summer parties, backyard cook-outs, and bbqs throughout the midwest, in fact we have a type of party devoted to devouring the good stuff, called corn roasts. Since I can't exactly build a fire or a coal pit here in Manhattan, stove-top roasted corn has to suffice for my summertime cravings. 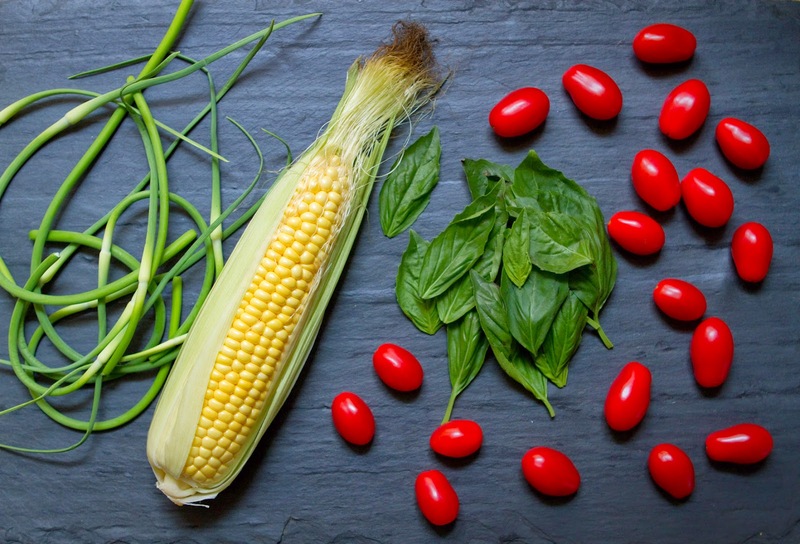 The corn around here comes from New Jersey, and I will say that it's pretty darn good. New Jersey, despite being the most densely populated state in the country, grows some pretty tasty produce. It'll never be Ohio sweetcorn, but it's tasty all the same. And paired with goat cheese, basil, and garlic scapes it was phenomenal. 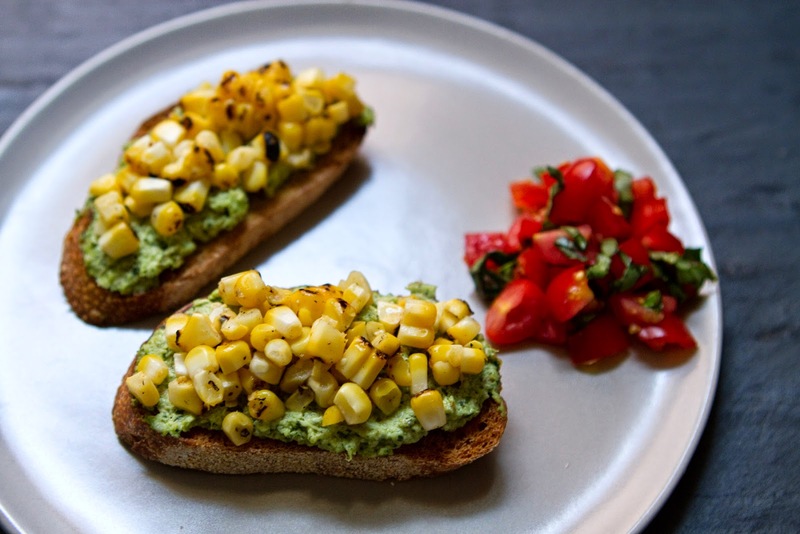 The sweetness of the corn on these crostinis mingles wonderfully with the herby pesto and tangy goat cheese to create a great, crispy, creamy, herby, roasted appetizer. These would be a great addition to a backyard barbecue, or a garden cocktail party, and they would certainly make you the star of your next potluck. Enjoy! Preheat oven to 450 degrees fahrenheit, and slice baguette into 1/2" slices. Place directly on oven rack, or on oven safe cooling rack in oven, for 3-5 minutes, until toasted. Check often to keep from burning. Remove and allow to cool. 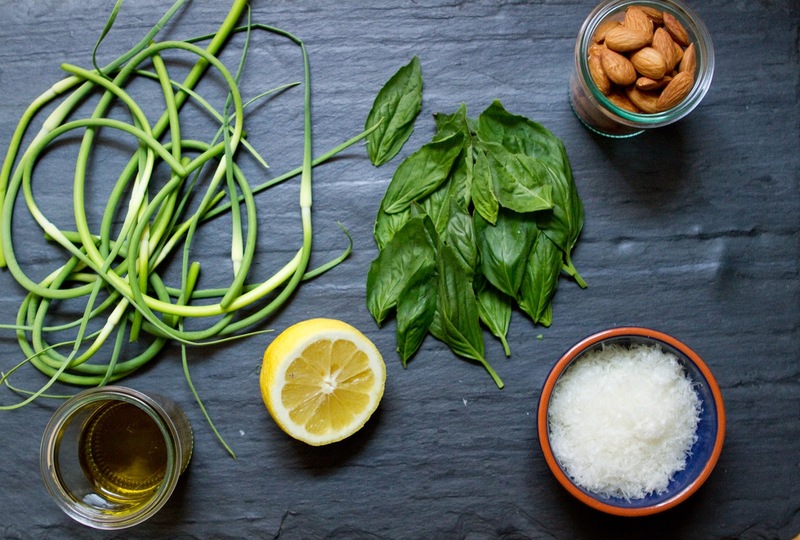 Chop the long, grassy, thin part of your scapes off, then chop into 2-3" long segments, place scapes, basil, hard cheese, almonds, and 1/2 C olive oil in food processor, and add the juice of 1 lemon, and a dash of salt and pepper. Blitz until mixture becomes a thick, pasty pesto, about 3 minutes. Add the goat cheese, and process again until thoroughly combined. 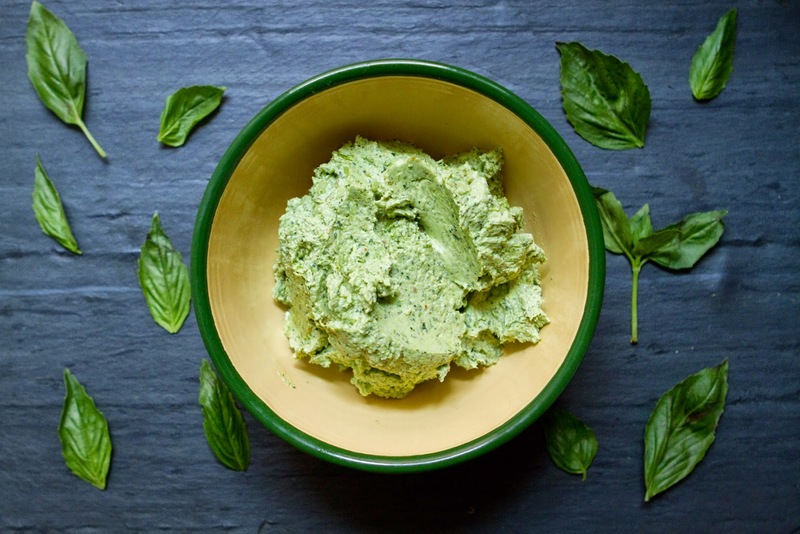 Mixture should be relatively smooth, but some bits of basil or almond are acceptable. Set aside. If you have a gas range, you can roast your corn directly on it. If you have a electric range use these instructions. For a gas range, shuck corn and place directly on the range, adjust heat so the flames lightly lick the corn ear, then turn often, until all sides of the corn have blackened a bit. Don't worry about making it even, just make sure to expose all areas to the flame for a bit. 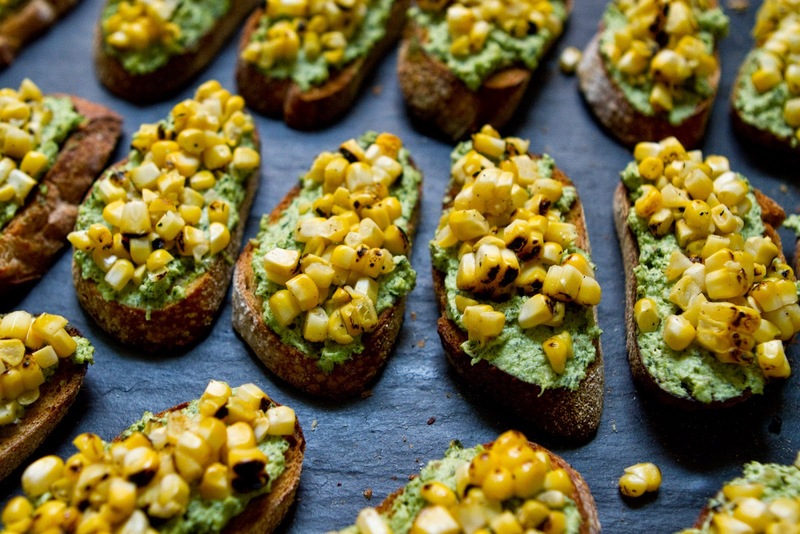 Remove kernels from the corn ear. 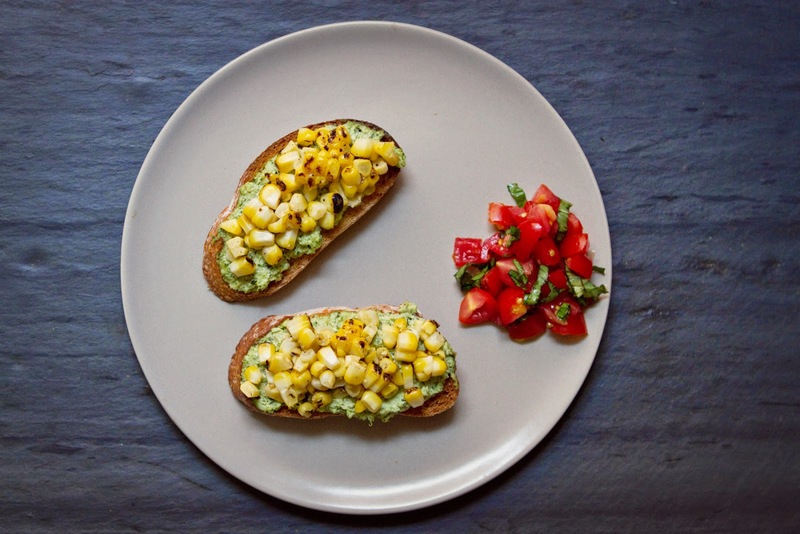 To do this, I place a small, round tupperware, like the type one gets a small order of to-go soup in, upside-down at the bottom of a large bowl, stand the corn ear on top of it vertically, wider end down, then use a large, sharp knife to carefully cut straight down, removing the kernels from the cob. The tupperware makes a nice stand so the cob is elevated above the bowl, making cutting much easier. Remove tupperware from bowl after kernels are removed, and add 1 tsp olive oil, and the juice of 1/2 a lemon to the corn kernels, as well as a dash of salt and pepper, toss to combine. 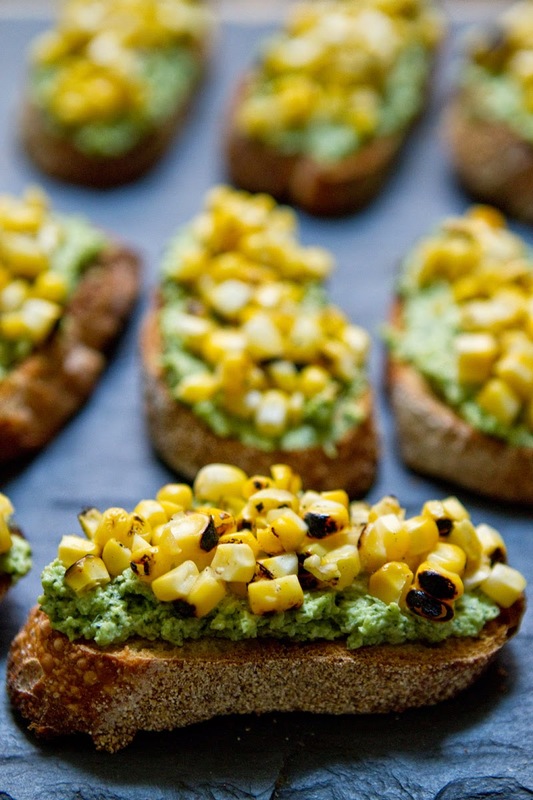 Smear a spoonful of pesto goat cheese onto each crostini slice and spread out, then top with a little pile of corn. 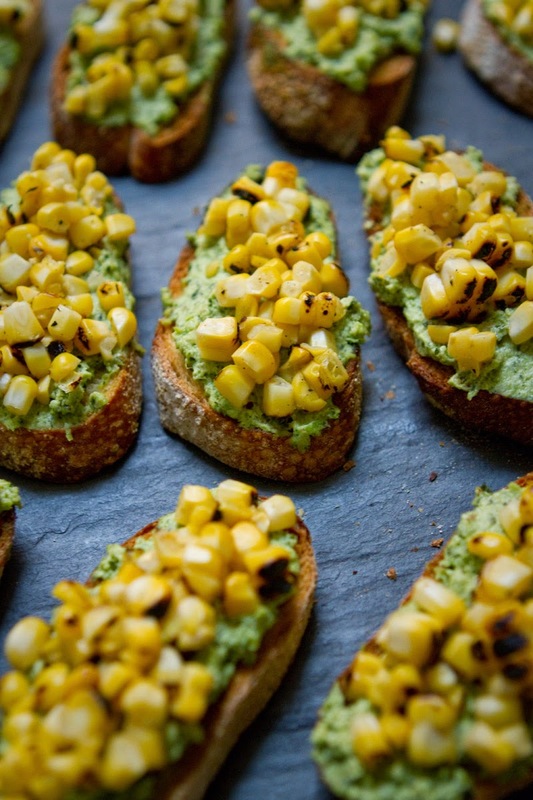 You can lightly press the corn into the goat cheese to help it stick, if desired. If not serving within an hour or so, I recommend waiting until just before serving to assemble. Otherwise, you can store assembled crostinis, covered, in the fridge. But if you store them in the fridge too long the toast will soften a bit. Enjoy!